Kübler is offering a special service to its customers for the inclinometers in its IS60 series.The inclinometers can be ordered ready parameterized to a customer’s specific requirements. This allows the user to install the inclinometer in his application without first having to set it up and configure it. This saves time and installation costs, as well as avoiding errors during installation. All the customer-specific parameters are stored in the internal non-volatile memory. 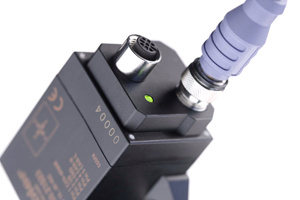 The inclinometer IS60 for CANopen field bus networks measures 2-dimensional inclinations. Depending on the version, measurement ranges of ±10°, ± 45° or ± 60° are possible. The IS60 has an extraordinarily compact and robust plastic housing. This is also substantiated by the high protection class IP68. Icy temperatures, sweltering heat or other inhospitable conditions do not present any problem for it. The range extends from -40°C to +80°C. Other factors include the excellent resistance to shock and vibration as well as a high sampling rate and bandwidth. Two M12 plug connectors ensure a secure connection. This is the ideal inclinometer for use in harsh industrial environments and impresses with its high resolution and accuracy, as well as its parameterizable vibration suppression. The calibration accuracy (at 25° C) is ± 0.1°.